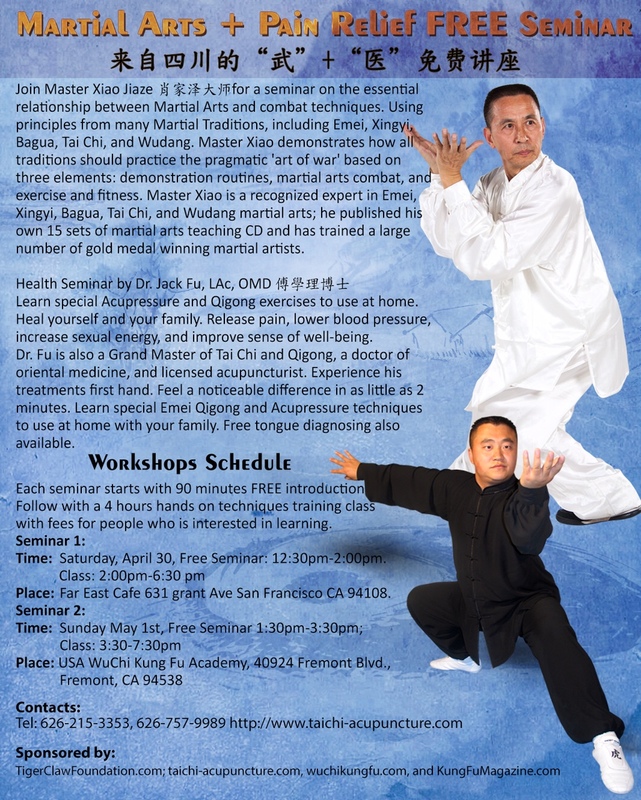 Join Master Xiao Jiaze for a seminar on the the essential relationship between Martial Arts and combat techniques. Often Martial Arts training focuses on performance of routines, but combat techniques to are ignored in the transmission of the techniques over time. Using principles from many Martial Traditions, including Emei, Xingyi, Bagua, Tai Chi, and Wudang, Master Xiao demonstrates, how all traditions should practice the pragmatic ‘art of war’ based on three elements: demonstration routines, martial arts combat, and exercise and fitness. To respect the succession of traditional martial arts and to apply scientific training methods, this is the right way of martial arts. 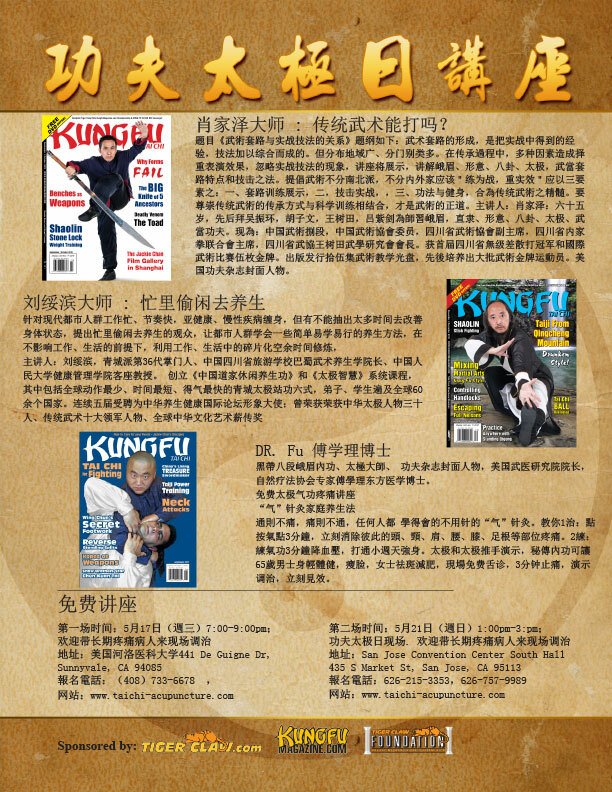 Master Xiao is in San Francisco at the invitation of Kung Fu Magazine from Sichuan Province, China. He is a recognized expert in Emei, Zhili, Xingyi, Bagua, Tai Chi, and Wudang martial arts; he published his own Shi Wu martial arts teaching CD set and has trained a large number of gold medal winning martial artists. Master Xiao is a member of the Chinese Wushu Association, President of the Association of Sichuan Province Wushu Xie. Learn special Acupressure and Qigong exercises to use at home. Heal yourself and your family. Release pain, lower blood pressure, increase sexual energy, improve sense of wellbeing. 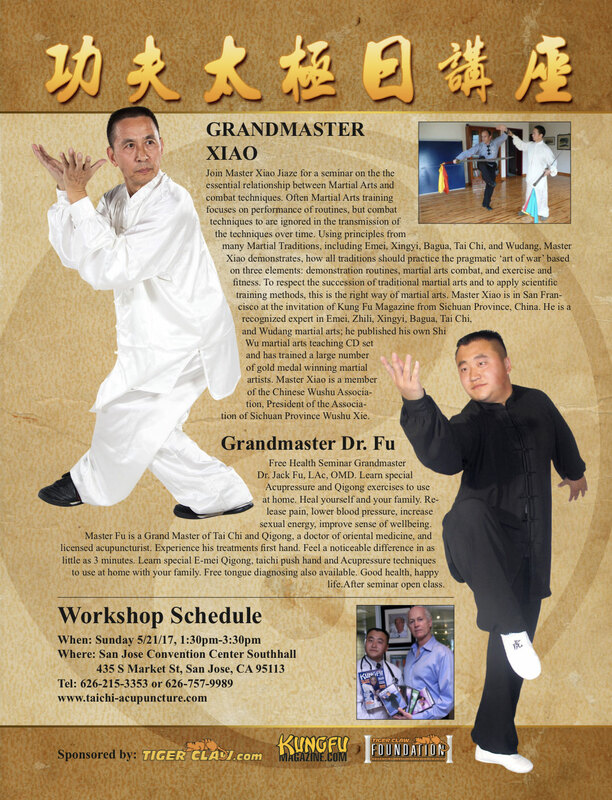 Master Fu is a Grand Master of Tai Chi and Qigong, a doctor of oriental medicine, and licensed acupuncturist. Experience his treatments first hand. Feel a noticeable difference in as little as 2 minutes. Learn special E-mei Qigong and Acupressure techniques to use at home with your family. Free tongue diagnosing also available. Good health, happy life.After seminar open class. Where: Far East cafe 631 grant Ave San Francisco ca 94108. Taught by LA Black Belt 8thDuan Grand Master Dr. JackXueLiFu, Lac, PHD OMD. Dr. Fu will be giving a free Qi Acupuncture/Family Wellness Seminar where you will learn specialQigong and Acupressure methods to use at home to heal you and your family. Techniques includespecial Qigong exercises, qi acupressure and qi muscle testing. Everyone in the room will feel their qi in three minuteswhile experiencing these methods. Just one minute a day of Qigong exercise will reduce high blood pressure without medication and five minutes a day will build up your qi to improve chronic health conditions such as diabetes and irritable bowel. You will be able to use acupressure/acupuncturetechniques to heal yourself and your family of any neck, shoulder, low back, knee, leg or ankle pain as well as headaches, sleep disorders, digestive problems and conditions such as high blood pressure, obesity, diabetes, colds and other illnesses. Benefits of these methods include weight loss, physical fitness, increased focus and concentration, better sleep, and stress reduction. In just two minutes of applying these techniques you can release any pain felt anywhere in the body. A demonstration of these techniques will be given and applied to those attending the free seminar. There will also be free tongue diagnosing and muscle testing methods done.